A ragtag collective of bugged-out, «savant-garde» rappers and trash-can producers known as Anticon — short for anticonformist — was born with the recording of The Taste of Rain…Why Kneel, and with it arose a clandestine revolution of anarchic, D.I.Y. hip-hop. Descending «from the outskirts of obscurity» (as the opening moments of «Deep Puddle Theme Song» explain) and converging — by way of Cincinnati, the suburbs of Chicago, and Portland, ME — in the Minneapolis living room of Atmosphere’s Slug on June 26, 1998 (and in Chicago a year later to the day), the nine-member-strong Deep Puddle Dynamics helped to spark one of the most interesting millennial movements in rap music with this debut album. 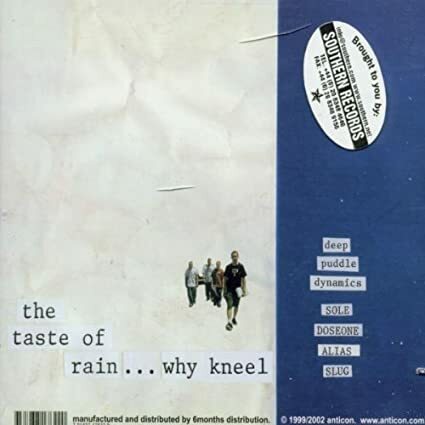 Compared to some of the efforts that were soon to come from the Anticon stable (as well as from fellow nonconformists at Rhymesayers and Definitive Jux), The Taste of Rain doesn’t flaunt rap conventions too dramatically. But then, «conventional» is always a relative term when applied to such an iconoclastic amalgam of artists. In Anticon’s case, it means KRS-One, hip-hop’s moral and ethical exemplar, is quoted alongside former Supreme Court Justice Oliver Wendell Holmes, for instance, so normal does not apply by any traditional connotation. Nevertheless, the album — its sound, if not the complexly schizophrenic, multi-MC viewpoint, like voices debating inside a single mind — usually maintains at least a foot in the traditional hip-hop underground, with its gritty, structured musical underpinning halfway between Wu-Tang creep show and macabre postapocalypse. It all culminates with the dazzling, multipart suite «June 26th, 1999,» which pointed the Anticon juggernaut in the thrilling direction it would continue to probe in subsequent years.